Essential WordPress Plugins… Why essential? There is a reason why almost all bloggers use WordPress or will end up using WordPress as a blogging system in the end. Sure, you can start your blog on Tumblr. Or use a website builder like Strikingly or Squarespace to start your blog. But in the end you will end up finding a feature – probably more than just one – that you need or desperately want, that is not supported by your system of choice. Due to WordPress open nature and also due to the time it has already been around, almost every feature possible is already there. Either it has been integrated into WordPress core, or it has been created by the community in the form of a plugin. There are 1000s of plugins – the WordPress plugin directory shows almost 46,000 plugins at the time of writing. The sheer amount of WordPress plugins can be overwhelming. Which ones do you need? Which ones do you want? Which ones should you pass on? The key to finding the right plugins that are essential is to find plugins that not only give you new features, but to find plugins that give you features that make you a better blogger. If you started out your blogging career thinking that SEO won’t be important because you are going to focus on Social Traffic (or something else), you’ve been living under a rock. SEO is important – even if you, like us, decide that you will focus on different traffic sources (like we do – we are called The Social M(arketer)s for a reason). When you are starting out, SEO can be confusing. Sure, it’s about backlinks and keywords. Backlinks are what is done off site – other pages linking to your site. Keywords are the search terms that you sprinkle throughout your posts so that Google knows that your content is about a certain topic. But how do you sprinkle these search terms throughout your course? 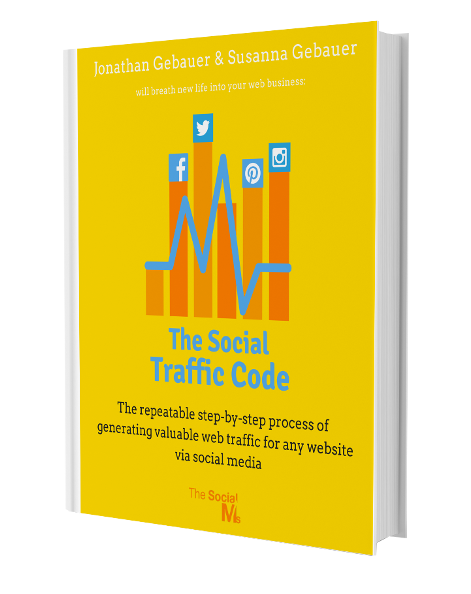 How do you write your post so that it does appeal not only to users but also to an algorithm? How long should your content piece be? How do you change the meta descriptions? What’s a good title for SEO? As you can see, Yoast provides features that exceed pure SEO – there are social media features and features that can improve the actual quality of your posts. That is why this plugin doesn’t just increase your keyword optimization but also helps in making you a better blogger. Yoast is the essential SEO plugin for WordPress that you can rely on. And therefore it is one of the absolutely essential wordpress plugins for any blog. Yoast SEO gives you easy to follow advice on how to optimize a post for SEO. There are many things that make your blog “good”: Content is one of them. Another quality of a good blog that is almost as important is speed. How fast your page loads has an immense effect on the user experience: If a user has to wait 10 seconds for every page to load, the probability that he will open a second – or even a third or fourth page – is significantly lower than if your page loads in 3 seconds or less. Studies show that this 3-second mark is important – in fact, 40% of people abandon websites that take more than 3 seconds to load. Now, if your blog is new, you are probably on weak hosting. And there is nothing wrong with that. You cannot invest 100s of Dollars into something that may take months or even years to pay off. But how do you get your page load times as low as possible when you don’t have the server power to get your page fully loaded on a users screen in no time? Caching allows your site to keep certain resources ready for distribution. For instance, if your site features dynamic content that changes from time to time, it keeps a dynamic element saved in memory ready for distribution as long as it has not changed since the last request. For instance, if someone searches on your blog for “SEO”, the results would stay the same until you publish new content about SEO. So why conduct a search when no new content has been published (searching your blog entries takes up server time and resources) while you could just save the results page as a static page until new content is published? In fact, all modern websites do use caching – and usually multiple layers of caching. Among the many possible caching layers there are things like Cloudflare (which is a combination of a CDN and an offsite caching layer and also recommended), Memcached, Varnish and more. One of the most important caching layers, however, is a caching engine that is integrated directly into WordPress itself, and that is what you can have through the W3 Total Cache plugin – absolutely for free. The advantage of a caching layer integrated into your WordPress site itself is that WordPress itself knows best which content can be cached. W3 Total Cache is relatively easy to use, and integrates very well with possible other layers. Its caching engine is high performance optimized. Some sites do have trouble with W3 Total Cache – if that turns out to be the case for you can also have a look at the almost as good WP Super Cache. However, if you can, use W3 Total Cache – it really is an essential WordPress plugin for caching. W3 Total Cache allows you to easily integrate a caching engine into your blog. Google’s free offering for web analytics is also one of the best analytics offering for websites that is out there. The combination of being free while also being able to deliver fairly advanced analytics for any website it is installed on makes it a no-brainer for most bloggers. But there is one downside to this: You have to open a different website to see the analytics. And that can be a pain. How often do we not check our analytics, simply because opening a different website, signing into a different tool is not practical at that moment in time? Maybe you just published a blog post and just want to have a quick look whether your newsletter is driving traffic. Or you shared a link on Facebook and just want to see whether it’s driving traffic? Not having analytics open while you have your WordPress blog open automatically, can lead to missing out on heavy traffic spikes – and once you notice them later it can be too late to benefit. Noticing your 1000s of clicks too late can lead to missing out on advertising revenue for instance. Also, manual installation of Google Analytics in your WordPress blog can be a bit of a pain. Luckily, there is a plugin for WordPress, that solves both of these issues. The Google Analytics Dashboard for WordPress integrates directly into your analytics dashboard while also ensuring that your site has the Google Analytics code integrated on every single page of your site. It makes you react quicker and therefore makes you a better blogger. 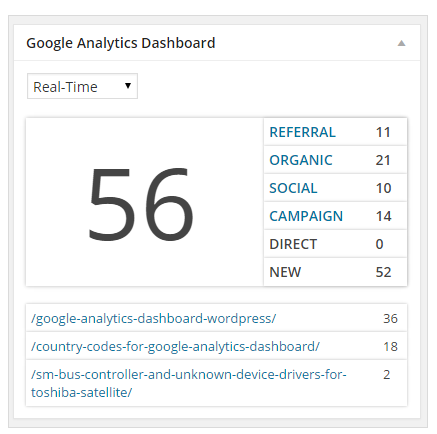 Google Analytics Dashboard for WordPress integrates almost the full Google Analytics experience into your WordPress dashboard. The SumoMe plugin gives you not just one tool, it gives you a lot of tools. Sadly, not all of them are free. For instance, SumoMe is one of the best WordPress plugins for Social Media integration into your blog. It lets you implement their share buttons directly into your site so that they show up on every post. 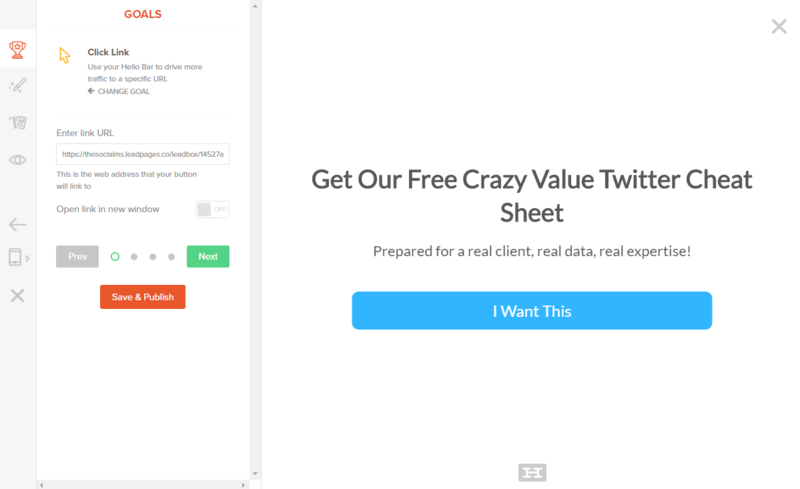 It also lets you integrate newsletter signup forms at various places of your blog. If you see a fullscreen popup when visiting an influencers blog, that is often done with SumoMe. SumoMe’s growing set of tools is optimized to giving you more traffic and to giving you the tools you need to achieve more web traffic on your blog. You can even exchange web traffic with other bloggers through one of their tools. If you want to make a business out of your blog, the traffic and data you can get from the tools Sumome provides are essential. 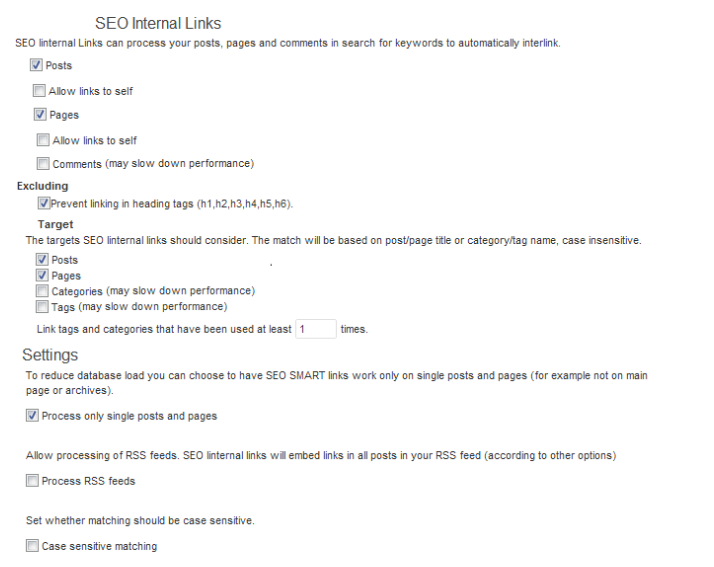 Yoast SEO, which I told you about above is great for optimizing your post for the main keyword. But if you know anything about SEO, then you know that optimizing for long tail keywords is a huge part of SEO these days. Let’s say I’m trying to rank for a keyword that has 50,000 monthly searches. That’s a lot of traffic, ad chances are that I’m not the only one trying to rank for this. There is probably a lot of competition. There is probably less competition on the connected long tail keywords. For instance, if I’m trying to rank for “SEO WordPress Plugin” there is probably less competition for “SEO WordPress Plugin Keywords and Backlinks”. When you are trying to rank for long tail keywords, it is important that you don’t just try to rank for one of them. You need to try to rank for many of them. If your initial keyword has 50,000, a typical long tail keyword might have 1000, or even just 100. But since it is so much easier to rank for these and there is much less competition, it is still a viable route. So, once you have optimized for your main keyword with Yoast SEO, it may be a good idea to sprinkle a few connected long tail keywords throughout your post. But how do you identify these long tail keywords quickly? Since each keyword may only give you a couple of clicks, you need a fast way to do that! Enter WP Keyword Suggest. 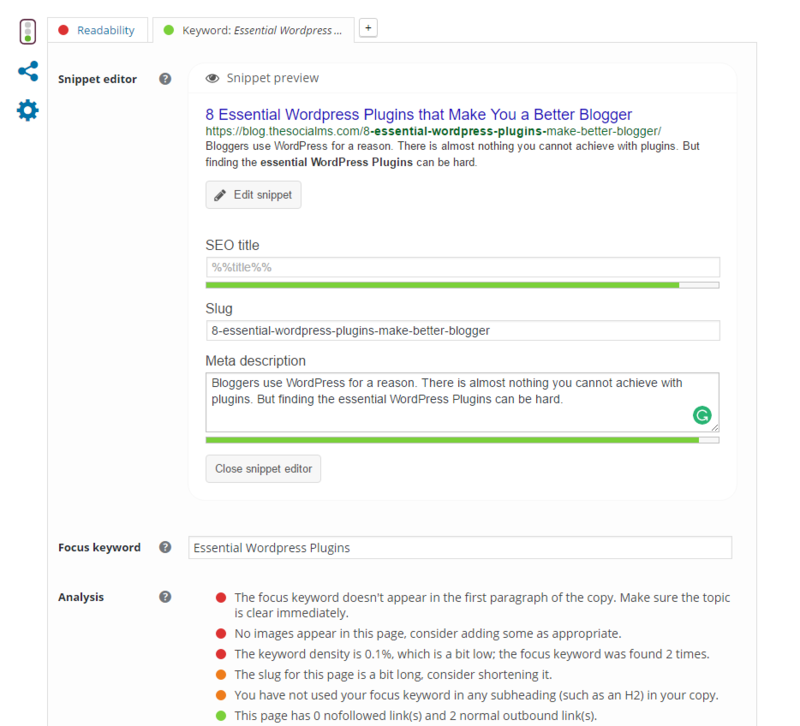 This WordPress plugin will give you connected keywords to any given keyword and therefore will help your SEO a lot to optimize for long tail keywords. Simply enter these into your post (where it makes sense) before you hit publish! One important part of optimizing your site is to provide your users with more content of the same kind through internal links. This is in fact so important that Google actually takes this into account in their algorithms. Which in turn means that this is also highly important for SEO. Sure, you can add a few links to other posts into the post you are currently editing by hand. But this is time-consuming and it will never be as good as when you have a well-optimized plugin that helps you with the process. SEO Internal Links does just that. It is also highly customizable and will help you set up specific rules and keywords for better optimization. As a plugin for WordPress, it helps you give a better user experience to your readers, which makes you a better blogger! When you are starting out as a blogger, you probably neither have a huge library of photos to add to your site, nor the budget to license immense amounts of stock images. When you are starting out with a new blog and want to get anywhere, you therefore absolutely need images. And the web today is cool, there are many sites on the web that give you free to use images (sometimes you need to attribute the image to its original creator, sometimes not, depending on the license). If you want to know more about which images you can use and what the licenses actually mean, read up on CC licenses and public domain images. But the problem is: These are scattered around the web, and when you are searching the various sites (Flickr for instance, or Pixabay) you can spend a lot of time. Image Inject will search many of these sites directly from your WordPress post editing form and allow you to directly enter them into your post. Free images to use are just a click away! Image Inject allows you to find those images that you are actually allowed to use… and add them to your posts right away. Strictly speaking, this is not a WordPress plugin, but a web service that you can easily integrate into your WordPress site via a plugin. But how do you get a list? Sure, anyone can have a simple newsletter signup. But the amount of visitors to sign up on these are probably few these days. HelloBar allows you to integrate various newsletter signups on various parts of your site. For instance, you can open a Welcome Gate (or full page takeover) whenever someone visits your site. After that, you can show the same visitor something else when he scrolled down on your site. and so on. 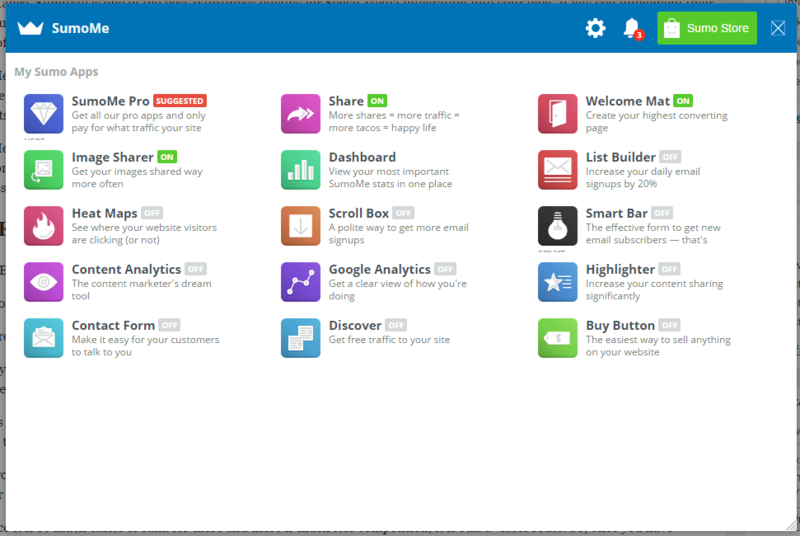 Similar tools to those in HelloBar are offered to premium users of SumoMe, but they come at a price. HelloBar is a lot cheaper (for these signup forms) and offers more options. You can still use the Heatmaps, ShareButtons and so on that Sumome gives you for free and use either the free or paid version (which is a lot cheaper than SumoMe) of HelloBar. 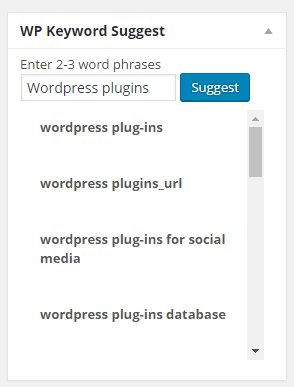 Some WordPress plugins should be user by every blogger, period. It’s not just that they make your life easier, it’s that they come with a feature set, that in fact turn you into a better blogger. They do this because they save you time, allowing you to spend your time on creating better content. Or they allow you to give your blog a better user experience by providing speed or easier navigation. What WordPress plugins do you believe to be essential? Looking forward to your comments!